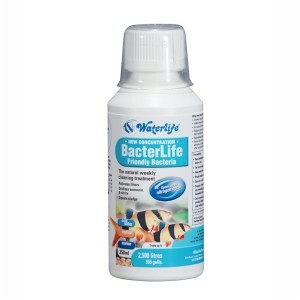 Bacterlife is a blend of essential filtration bacteria vital to filtration systems. These bacteria mineralise fish waste, uneaten food, and plant debris. BacterLife is superior to many of its competitors as it contains two types of bacteria. Virtually all bacteria products sold around the world contain Heterotrophic bacteria. These bacteria are responsible for the digestion and breakdown of solid organic waste in the aquarium.This breakdown of solid waste results in the production of Ammonia, and other soluble Nitrogen compounds, which can then be broken down by the filtration system. Products containing ONLY Heterotrophic bacteria will cause ammonia levels to INCREASE before they start to DECREASE. BacterLife contains Heterotrophic bacteria AND Autotrophic bacteria. The Autotrophic bacteria feed directly on soluble Nitrogen compounds in the water like AMMONIA and NITRITE. This means that BacterLife will IMMEDIATELY start to reduce the AMMONIA levels, without any dangerous increases. Suitable for use in all aquariums.